A bit of a special treat this, the second Elvis show to be added to the archive (check out the first one I did from 1956 here); this is believed to be the earliest soundboard recording that exists of Elvis in concert, recorded during the first week of his return to live performing, in Las Vegas in 1969. Elvis had last played live in 1961 and then spent most of the 1960s making films in Hollywood, his final film being in 1969, which finally left him able to return to playing live. After wanting to return to live performances for some years, a deal was made for him to appear at the International Hotel in Las Vegas from 31 July all the way through to 28 August - his first live appearances in 9 years. In all during that run, he performed 29 shows to over 100,000 people; a run so successful he returned there the following year, playing again in August 1970, which spawned the film Elvis: That’s The Way It Is. Over the years a few of the concerts have been made available as commercial releases on CD but only from later in the residency; certainly not one from so early in the run. 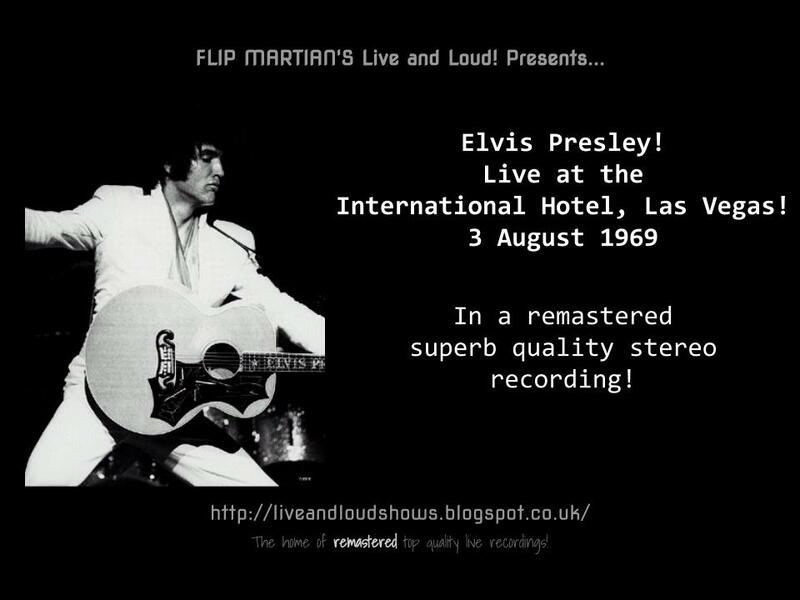 Anyway, after working on this for a while with some EQ and studio toys, I hope you agree its polished up really well - it a very listenable stereo recording with plenty of chat from Elvis in between songs, just as it all happened, on 3 August 1969! The show is available for free download HERE as 1 MP3 file. Or, if you would like to have separate tagged MP3s, or even lossless files in FLAC format, head on over to the Donations tab to see how you can obtain these for a very small donation towards the site costs. Thank you! Thank you very much!!! You're very welcome, thanks for stopping by.